The government is to introduce new rules to stop "politically-motivated" boycotts by local councils. Ministers said they would amend pension and procurement policies to prevent boycotts and removal of investments. The Conservatives claim new Labour leader Jeremy Corbyn and trade unions had urged councils to "punish" Israel and UK defence firms. Labour is yet to comment on the claim, but Mr Corbyn has backed boycotting goods produced in Israeli settlements. He has also called for an arms embargo to be imposed on the country. In recent months, Leicester City Council has boycotted goods from Israeli settlements in the West Bank - a move being challenged by Jewish Human Rights Watch. The Labour-run council says it opposes "the continuing illegal occupation". Leicester councillor Mohammed Dawood said in August the move "was not an attack on a particular faith but is about a particular policy." "We are talking about produce… and we are saying we won't be getting anything from the illegally-occupied territories in the future," he said. Four Scottish councils have resolved to boycott Israeli goods in recent years, according to the Scottish Palestine Solidarity Campaign. 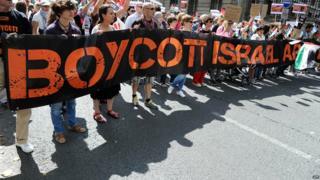 Other councils in Wales and Northern Ireland have also backed boycotts. A Conservative spokesman said there was "growing concern over militant actions of left-wing councils, spurred on by trade unions and the Labour leadership". Such actions "threaten to poison community relations and harm Britain's economic and international interests", the spokesman added. "Labour's Jeremy Corbyn and John McDonnell, alongside Labour-affiliated trade unions, are urging councils to use their procurement and pension policies to punish both Israel and the UK defence industry," he said. "Separate hard-left campaigns against British defence companies threaten to harm Britain's £10bn export trade, destroying British jobs, and hinder joint working with Israel to protect Britain from foreign cyber-attacks and terrorism," he added. Greg Clark, secretary of state for communities and local government, said: "Divisive policies undermine good community relations, and harm the economic security of families by pushing up council tax. We need to challenge and prevent the politics of division."